Engine A – 1100 currently fitted to the sidecar. Came from a written off ’99 LT with less than 90,000km, I thought it would be a good one but after purchase I found the wrecker/someone had been doing burnouts on the bike (badly flat spotted brand new tyre). I had to replace 13 of the 16 valve buckets to make the clearances correct, that plus me running it up to temp before refilling the oil(my mistake) and it’s continual overheating (in stop/start traffic at any ambient temp) gives me little confidence in the long term future health of this engine. Plus lots of vibes and it’s a generally noisy engine anyway. Engine B2- Jamies replacement(NOT in my possession), when replacing the running gear in Jamies bike we found various damaged bits, mostly caused by a ham-fisted mechanic. The engine that came out(B1) supplied those bits: Timing cover stripped thread/pulled helicoil, Cam cover (gravel rash, ground through), one camshaft bearing cap (stripped thread). Engine D- An 8v engine with noisy main bearings, good runner otherwise. B1 is the engine I intend to reuse. I’ve checked the valve clearances and everything on this one is 100%. It should be a good one once everything is sorted. · Looks like D is going to supply some of the bits to locate the Hall Effect Sensor (missing from Jamies) and the water and oil pressure sensors at the water pump due to damaged wiring on engine. Hopefully I’ll have it fitted and running in two weeks’ time, the sidecar needs to be on the road and reliable for a trip to Mungerannie for the 2nd weekend of August(the biennial Off Centre Run) and possibly returning via the Birdsville track. My leave was only approved a week and a bit ago, that's why the concerted effort to get it done. 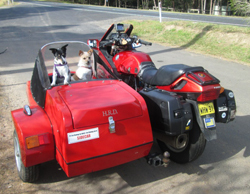 The outfit itself is also getting its fair share of attention, new sidecar swingarm bearings, new rear car tyre and new sidecar tyre, added 20l of fuel capacity, additions to the sidecar hood for the dogs comfort in case we strike bad weather. The list goes on. Either is yours for the asking and I could pack them up and send fairly quickly. They don't owe me a cracker as I never let anything go out as you have probably figured. keep in mind if you find a good 12 rivet output shaft out of one of those clunker engines, I'm interested . wonder if I have anything that I could trade you ...but mostly k100 8 valve stuff here . What year did the 12 rivet start? The 8v with bad mains has a very quiet output shaft, no knock whatsoever at idle. It's an 87 I think. Any 8V after may 90 will most likely have a 12 rivet shaft. @RicK G wrote: Any 8V after may 90 will most likely have a 12 rivet shaft. ETK shows a supercession from part 11211460903 to part 11211461499 on Sept. 27, 1989 so any 4 cylinder engine manufactured in Oct. 89 or later probably has the 12 rivet output shaft. I have been under the impression/assumption that they stopped using the 6 rivet about early '86 model production. No? I can honestly say that I don't know what the first owner of my bike, a BMW tech, did to it, as far as major reco goes, in the first 76,000 kilometres of its life, but replacing the OS would seem drastic. I guess I only have to remove the sump plate to find out. I will check for you Charlie. so it figures that the production part shifted to 12 rivet about then ? My RT is a 10/88 model and had the 6 rivet shaft, so later than that. It now has a 12.